A study published the May 2011 issue of Cephalalgia found that Coenzyme Q10 supplementation may help children who suffer from migraine headaches. Coenzyme Q10 is a vitamin-like compound found in every cell in the body but it is highly concentrated in kidney, liver, and heart muscle tissue. It has two main functions: energy production and antioxidant activity. CoQ10 is not considered truly a vitamin because we can make our own CoQ10, but small amounts can be found in food. Food sources include mainly beef, poultry, fish, soybean and canola oil, and peanuts. Dietary supplements are available and research is still emerging on who may benefit most from supplementation. In this study 120 children and teens received 100mg of CoQ10 or a placebo for 32 weeks. 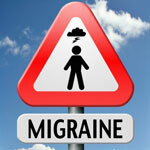 While both groups experienced improvements in migraine severity and frequency, the CoQ10 group reported significantly greater improvement within the first 4 weeks of supplementation. The researchers noted that further studies are warranted.